Our topic over the last 6 weeks was 'Iron Man'. 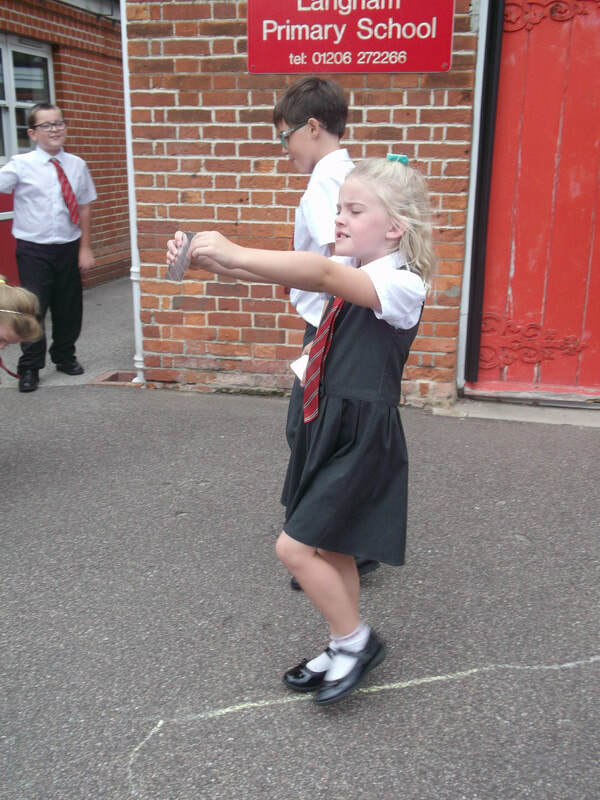 Class 3 loved listening to the story of 'Iron Man' by Ted Hughes and learning all about the 3 states of matter: solids, liquids and gases. 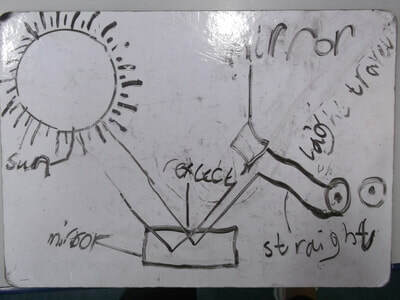 In Science, we learnt that some states can change through heating or cooling. 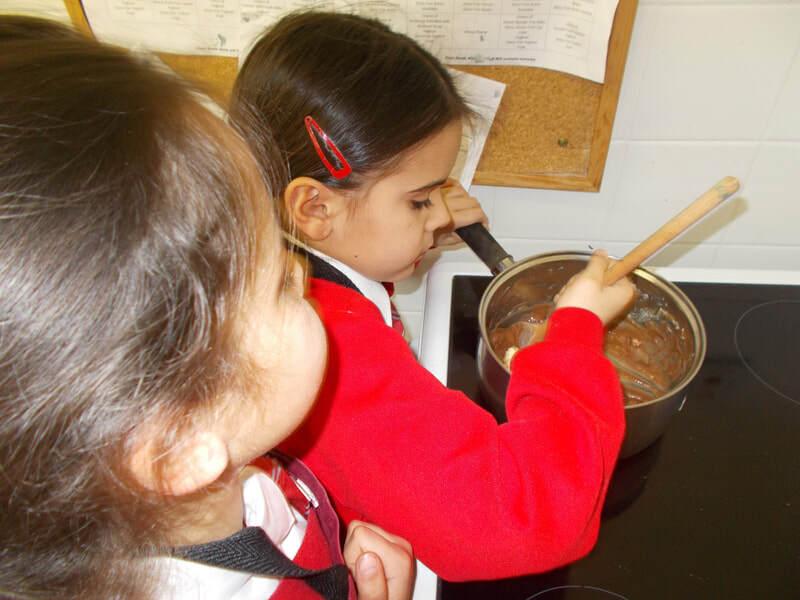 We observed these changes whilst making chocolate crispy cakes to eat whilst watching the film adaptation of 'Iron Man'. 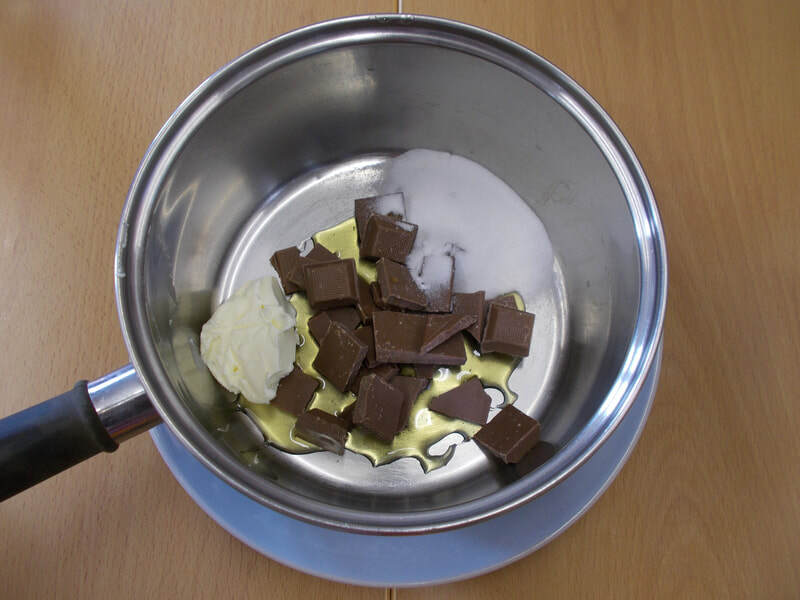 First, we noticed that the chocolate, sugar and butter were all solids but after being heated they changed state to form a liquid. 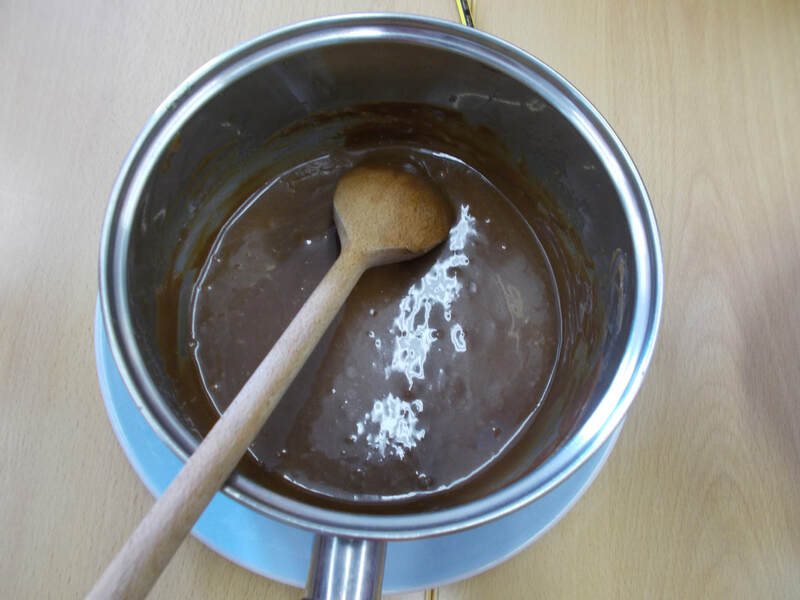 We also noticed that the pan didn't melt even though it was also a solid, we found out that this is because it had a higher melting point than the other solids. When the mixture was cooled down again, we saw another change of state from the liquid mixture back into a solid. 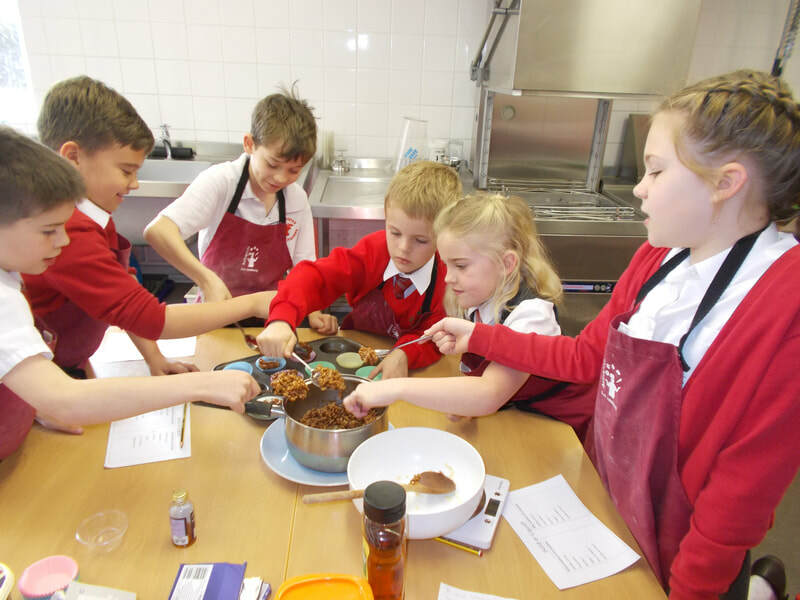 Our crispy cakes were delicious! 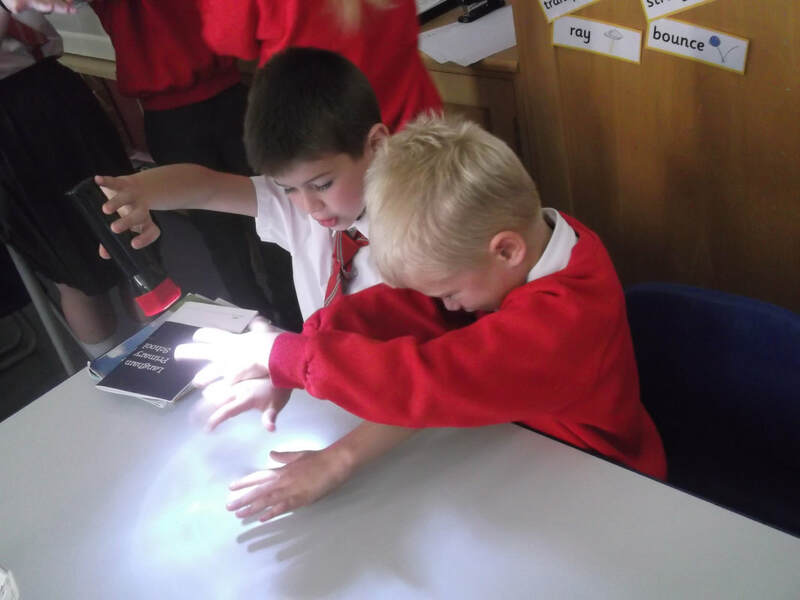 In the last week of term, we all got together and discussed how the lava lamps works and then watched them in action! 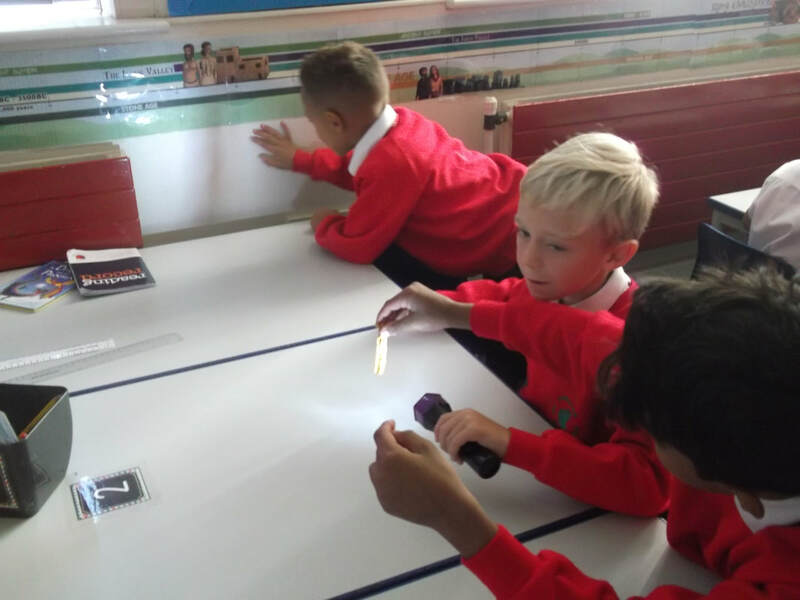 Class 3 have been extremely excited to learn all about Ancient Egyptian life this half term and it has been really interesting to compare it to our previous topic the Stone Age as these two civilisations existed alongside each other but in different parts of the world. 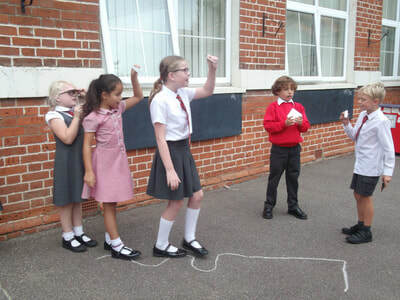 To conclude our topic, we went on a trip to Ipswich Museum to take part in an Ancient Egypt workshop. We had a fantastic day and Class 3 were very enthusiastic and excited to see real Ancient Egyptian artefacts! 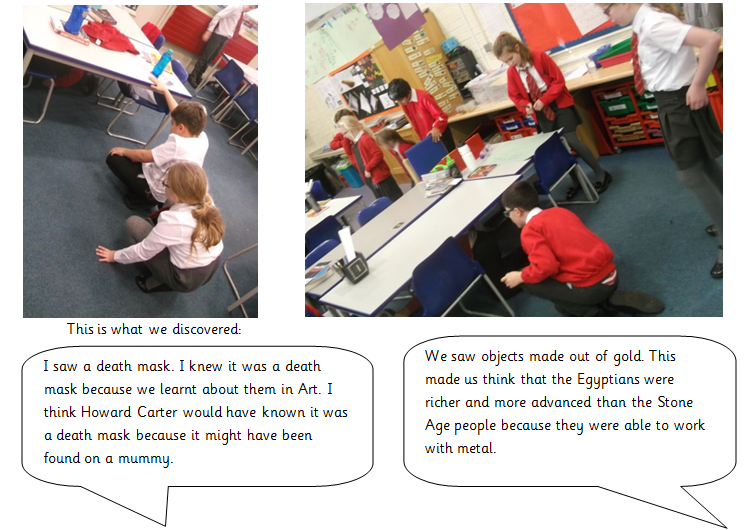 We learnt that Howard Carter discovered Tutankhamen’s tomb in 1922. He discovered many treasures that had been undisturbed for about 3000 years. 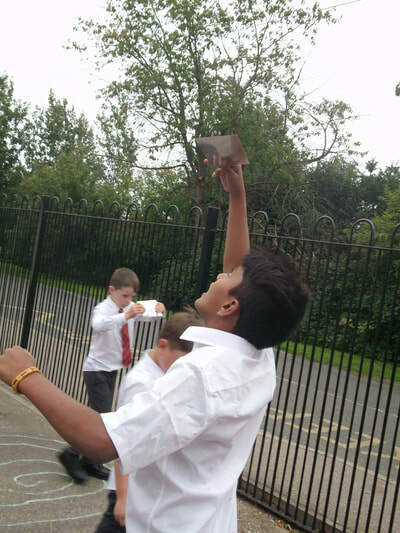 We re-enacted discovering some of these artefacts by exploring our own ‘tombs’. We had 10 seconds to get in and out of the tomb whilst remembering as much detail about the objects as we could. 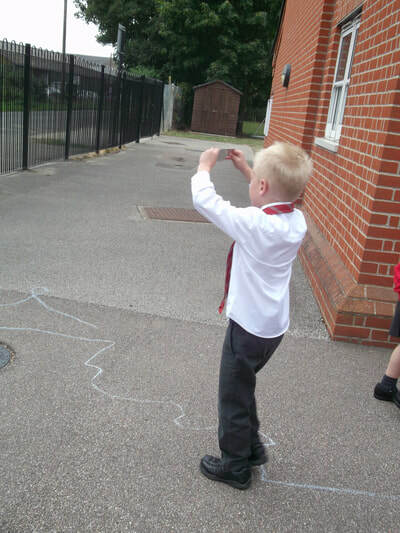 We then recorded what we saw whilst the next member of the team went into the tomb! 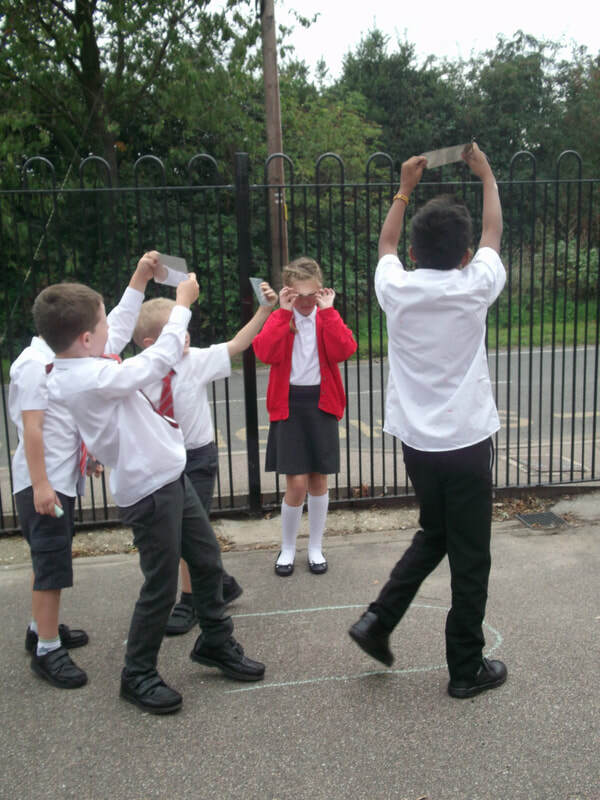 We started our 'Awful Egyptians' topic by learning about the pyramids. We also linked this to our maths topic of 3D shape and we completed an investigation into 3D shape to help us form opinions on why the Egyptians built square based pyramids. The base must be a square. It must have equal sides and right angles. The Pyramids sides must face North, South, East and West. We used straws and plasticine but the Ancient Egyptians actually used limestone blocks that each weighed 2.5 tons! This half term our topic is the Stone Age and we are really enjoying using historical evidence to find out about the past. 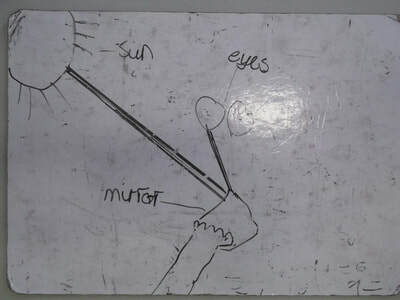 We have learn about Stone Age life, examined evidence from Skara Brae and discussed theories surrounding Stonehenge. 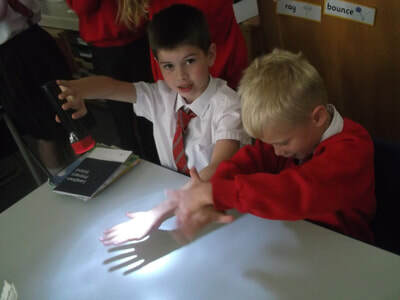 To bring our learning to life, we had a Stone Age morning with the Essex Wildlife Trust. We built dens, created Stone Age art and learnt how to make fire! We had a brilliant morning and we didn't want it to end! The whole school is currently working with an artist to create cyanotypes of the four seasons. Cyanotypes are created by using UV light sensitive chemicals on material or paper. First, we visited Horn Street Field near the school to collect autumn leaves that we wanted to use for our printing. When we got back to school, we went in groups to create our prints by laying the leaves on the treated material and then exposing the material to UV light. Whilst the rest of us were waiting, we created our own art inspired by the autumn leaves we found. Class 3 chose to create drawings of the leaves they found and we also went outside to create art using leaves, inspired by an artist called Andy Goldsworthy. We had a fantastic day! 1. Introduce the idea for this week and learn about how movies are made. 2. Create a story board. 3 Make the model and take photos. 4. Put photos into Movie Maker and create the film. 5. Create a soundtrack and record. 6. Add the music to the movie. 7. Watch the movies and see how well they went! Here is an example of one of our films! First we were given the challenge of making different shadows using a torch and classroom objects. After that, we learnt that shadows are created when light is blocked by an opaque object. 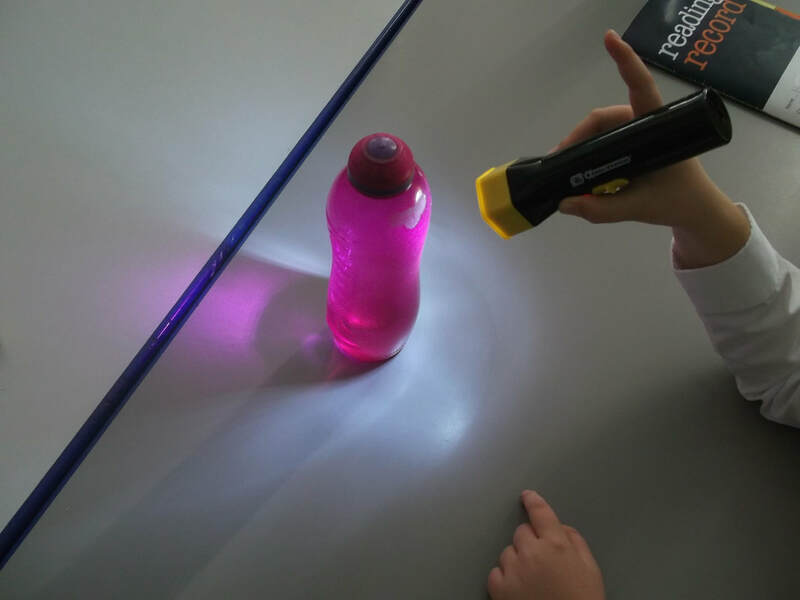 We also noticed that some objects created different shadows, for example we found some coloured translucent water bottles that created coloured shadows! Some of us also observed that you can change a shadows size by moving the object or the light source. 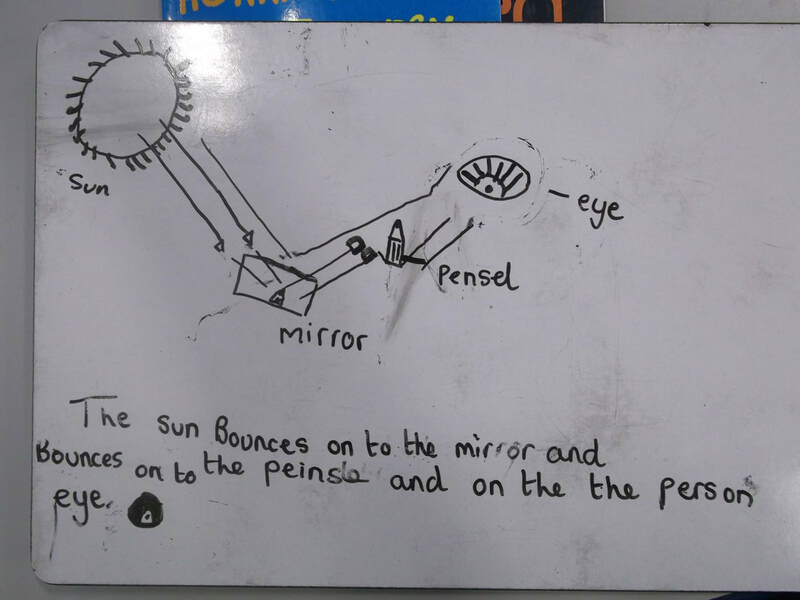 How does the distance between the object and the light source affect the size of the shadow? We planned out the investigation and recorded our results in a table using centimetres and millimetres. 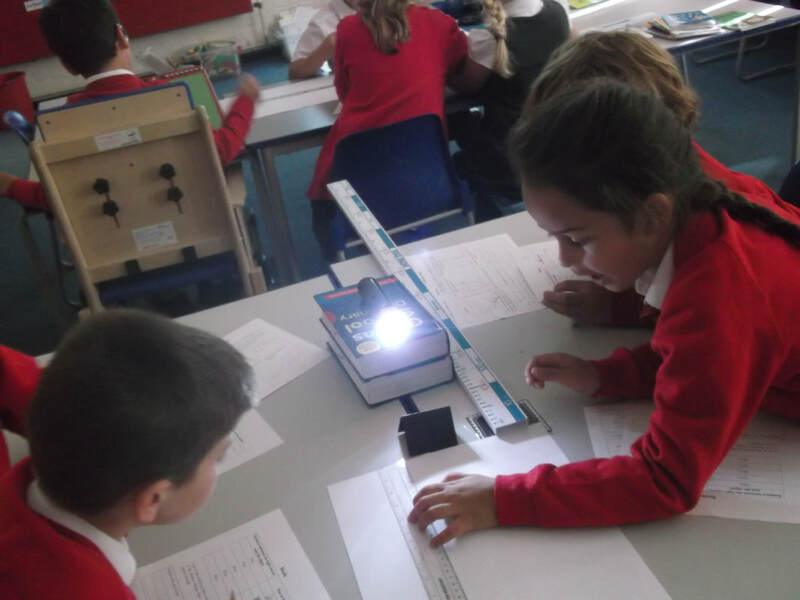 We had to be very careful to record the results accurately so we could draw a conclusion from our results. To begin our light and sound topic, we created our own obstacle courses! First, we tested them out. Next, we worked in pairs to direct our teammates through the course. We had to give very clear and specific instructions. After that, we did the same activity with our eyes closed! This proved to be much more difficult. We realised that we needed light to be able to see and also sound so we could follow the instructions. 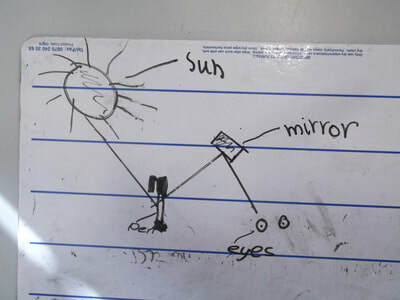 When we returned to the classroom, we discussed light sources. We decided that the light sources in the hall were the lights in the ceiling. 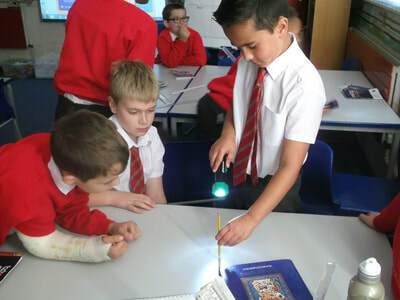 We learnt that a light source is something that makes light and we discussed that the moon is not a light source even though it appears to be. It only reflects light! 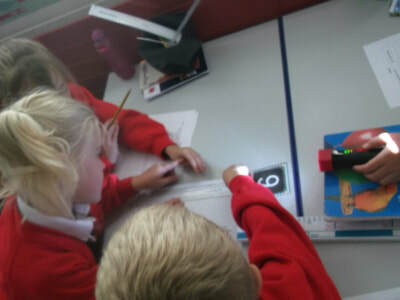 Using this knowledge, we then worked together to identify light sources. 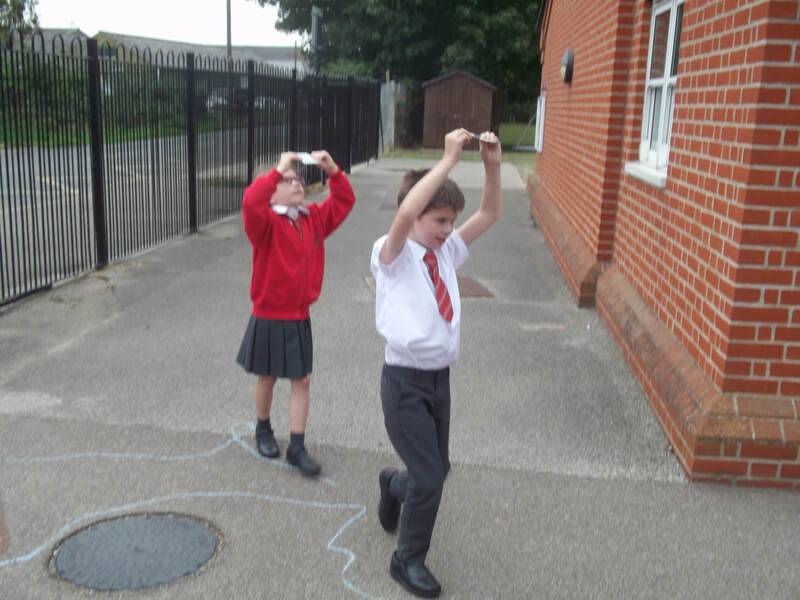 We have also been learning about how light travels. 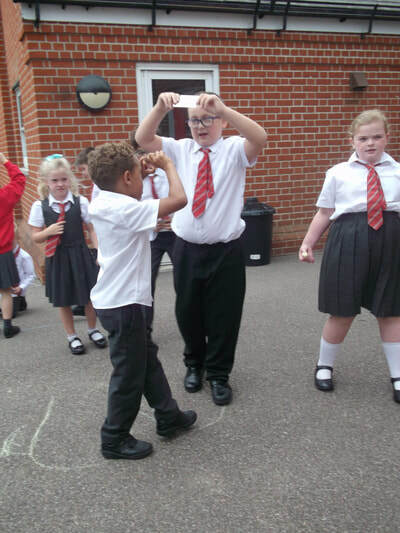 We used a mirror to write our names backwards and went outside to play a mirror maze game where we had to walk along the line but we were only allowed to look in the mirror! These games were tricky because the mirror shows a reversed image. 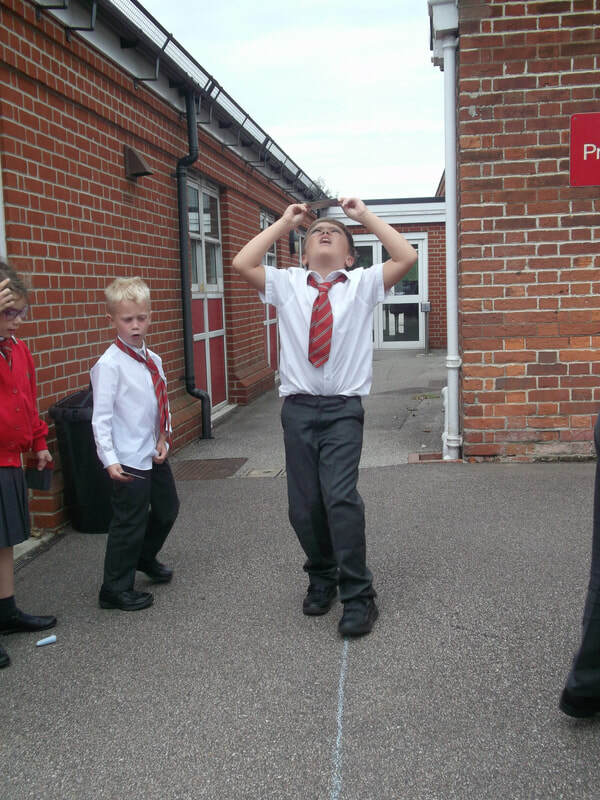 After playing some games, we focussed more on how light travels. 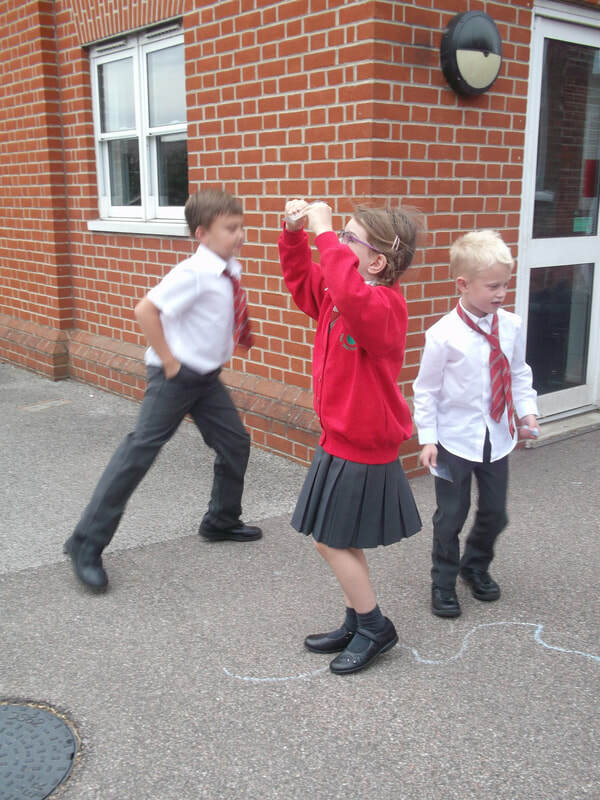 We acted this out using string to show how light travels in straight lines. We learnt that light travels from the light source, reflects off the object and into our eyes so we can see. Light always travels in straight lines so we had to make sure our string was tight. 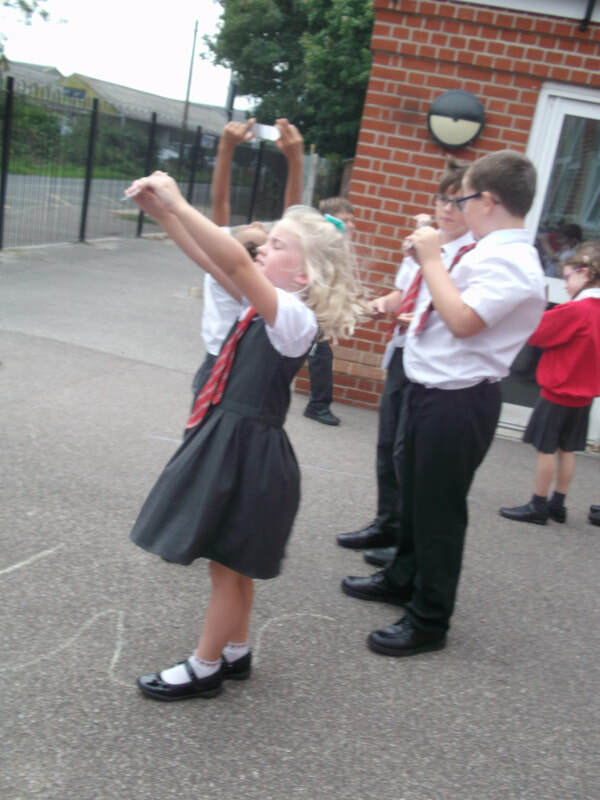 Some of us were given the challenge to include a mirror in our human diagram! 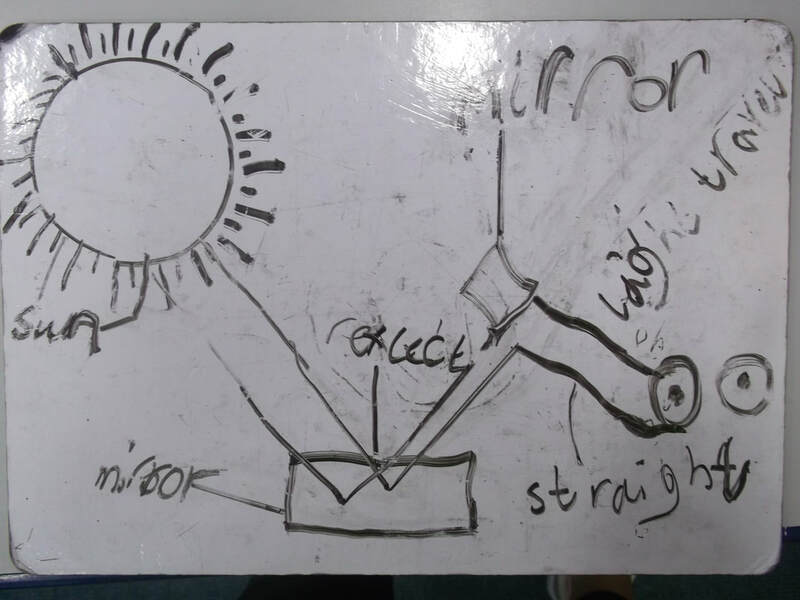 We learnt that the mirror reflects light really well because it is smooth and shiny. 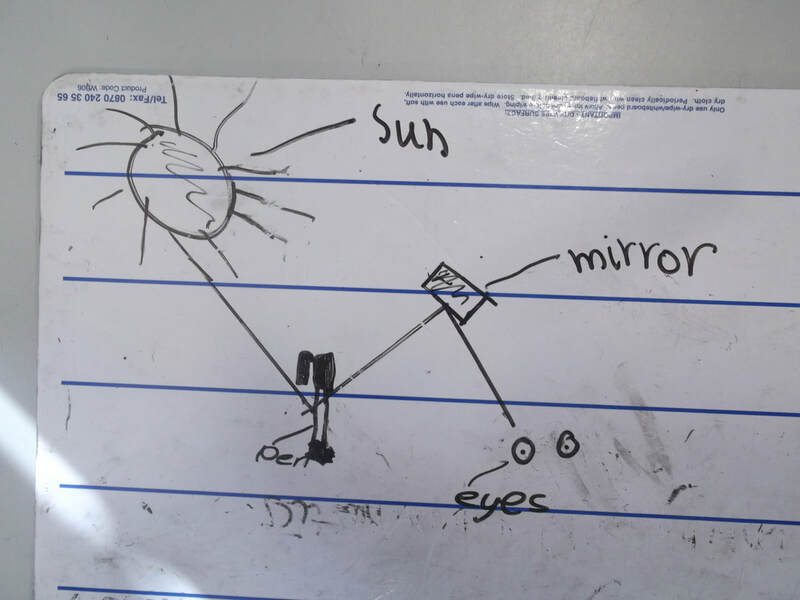 We had to stand in the correct position so we could see our object in the mirror.